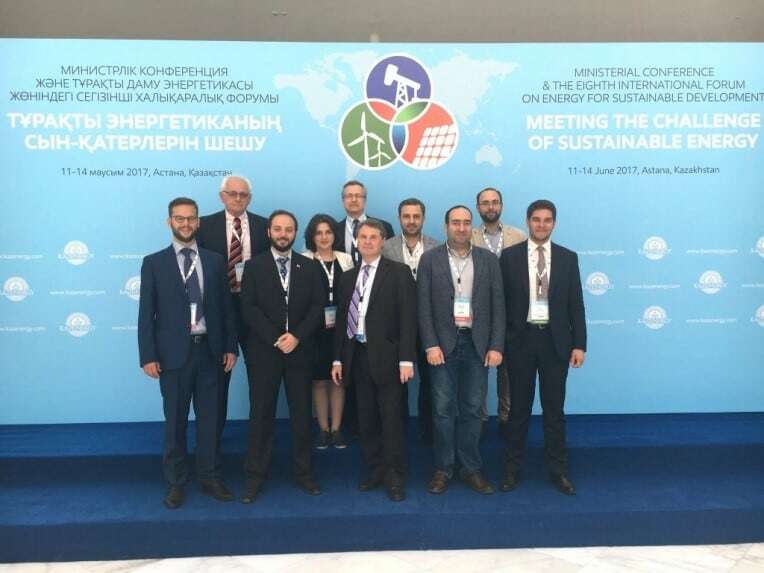 ME&A Representative Mikayel Koshkaryan was invited to present energy- and water-efficiency technologies and concepts at the Eighth International Forum on Energy for Sustainable Development and Ministerial Conference on “Meeting the Challenge of Sustainable Energy” June 11 to 14, 2017, in Astana, Kazakhstan. The technologies and concepts he presented were developed under the USAID/Armenia Advanced Science & Partnership for Integrated Resource Development (ASPIRED) Project, which ME&A implements. The Forum was hosted by the Government of Kazakhstan, supported by the five United Nations Regional Commissions, and linked to EXPO 2017 “Future Energy.” Also taking place in Astana, Kazakhstan, EXPO 2017 is an international exhibition running from June to September 2017 featuring the innovations countries, organizations, and businesses are contributing to an evolving energy system. Forum participants were particularly interested in the approaches the ASPIRED Team recommended for the Aquaculture Technology Transfer Center (ATTC), a proposed experimental aquaculture center where different technologies and methods would be tested, validated, and demonstrated on a smaller scale. Approaches include recirculation, passive settling, airlift pumps, bio-filtration, phyto-filtration, use of outlet water for crayfish farming, biological treatment of wastewater, anaerobic digestion, and photovoltaic kits. About 1,000 international energy experts and government officials as well as representatives from business, academia, and civil society attended the event. Key partners included the United Nations Development Programme (UNDP), the International Energy Agency (IEA), the International Energy Charter, the International Renewable Energy Agency (IRENA), the World Bank, the Copenhagen Centre on Energy Efficiency (C2E2), and the Renewable Energy Policy Network for the 21st Century (REN21). The purpose of the ASPIRED Project is to support sustainable water resource management and sustainable practices of water users in Armenia’s Ararat Valley through the use of science, technology, innovation, and partnership initiatives. The goal is to improve water efficiency in the aquaculture sector through the application of innovative approaches to energy and water conservation.